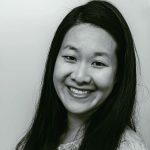 Published Aug 6, 2017 By Julia 5 CommentsThis post may contain affiliate links. 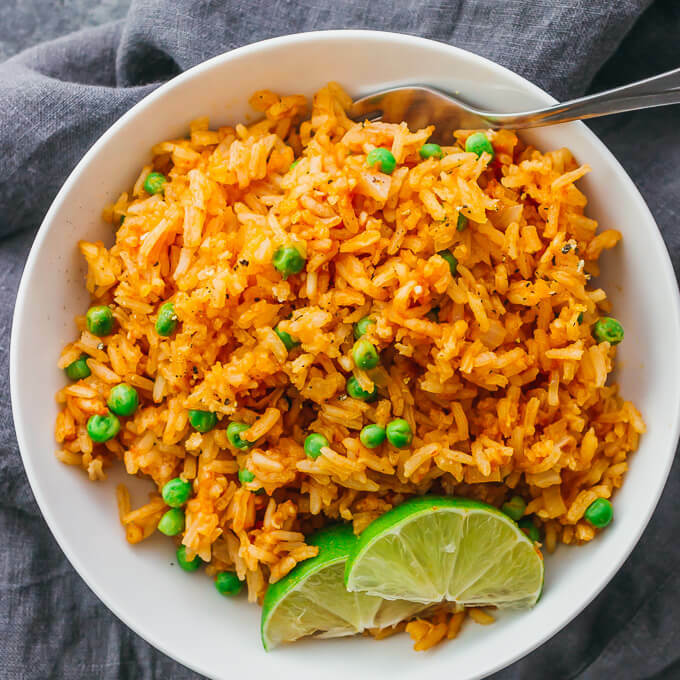 This mildly spicy Mexican rice with peas is easily cooked using a single pan on stovetop, and has lime, onion, and garlic flavors. Sometimes I find myself stuck in a rut where I’m making the same generic white rice every time. 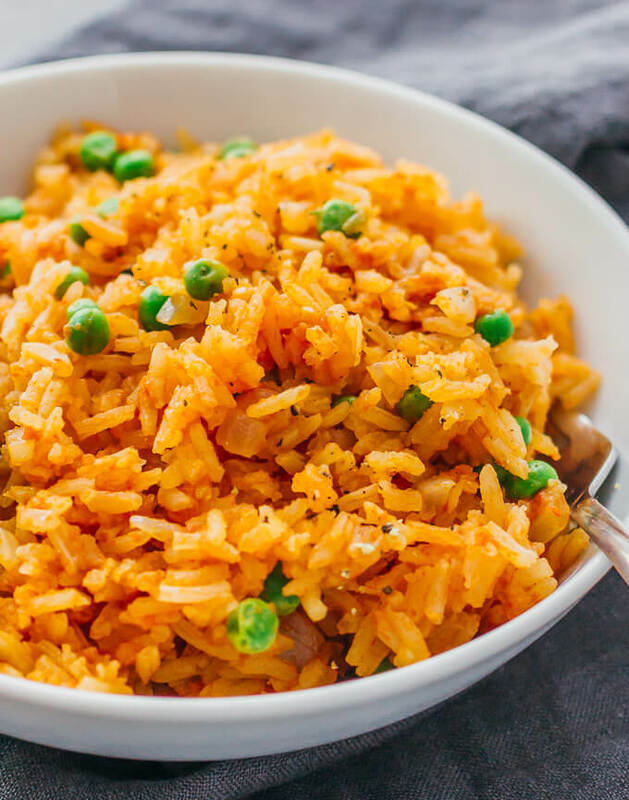 That’s where this Mexican rice comes in — simmered in tomato puree with onions and garlic, it’s flavorful enough to stand alone as the star of the show, and is reminiscent of rice served at Mexican restaurants. 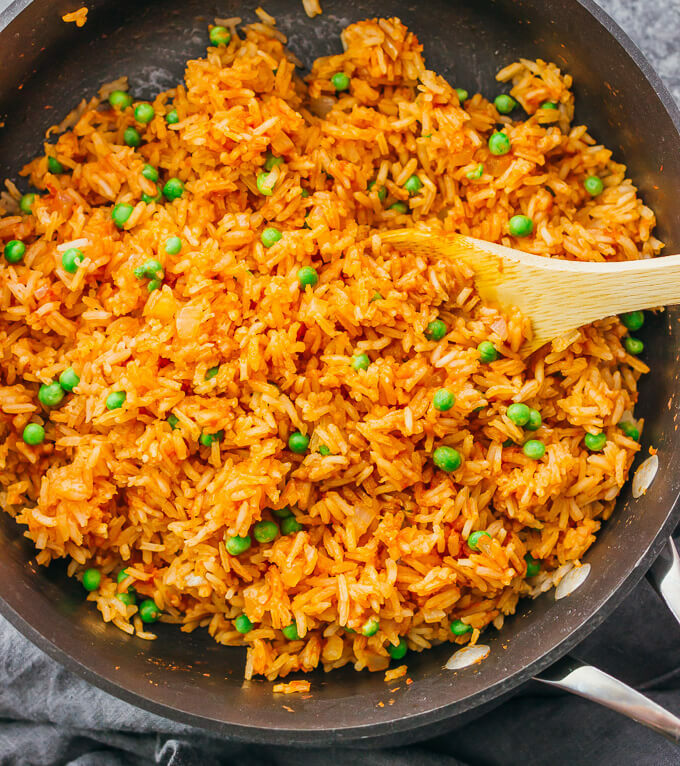 The rice, onions, and garlic are sautéed with some oil and then gently simmered on low heat with tomato puree and chicken broth until the rice is tender. You’ll end up with a comforting bowl of hot Mexican rice that you can enjoy as is, or as a side dish for an entree. 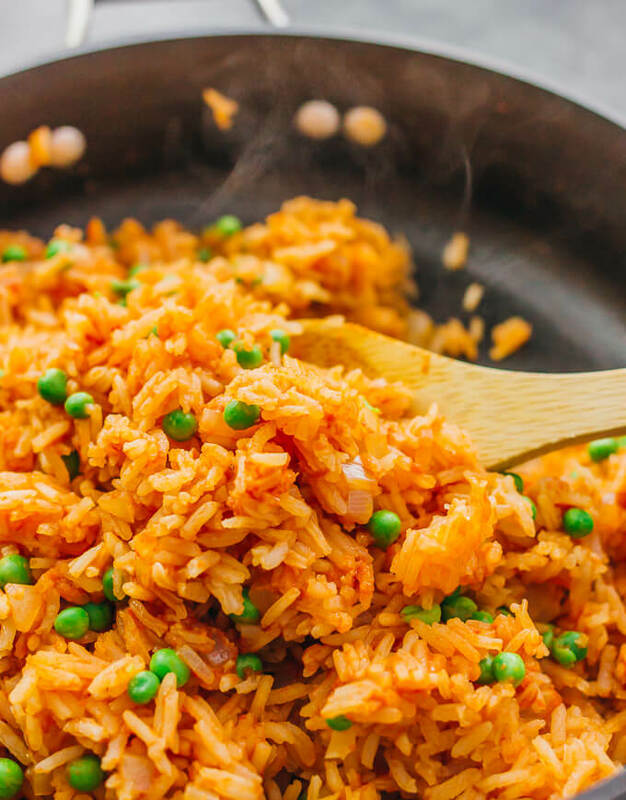 This Mexican rice is incredibly versatile. You can use it as a filling for salmon quesadillas, burritos, burrito bowls, or shrimp tacos. 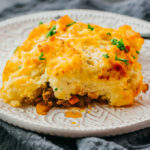 You could also serve it as a side dish to accompany chicken fajitas, steak enchiladas, or pork tamales. I also love pairing Mexican rice with other sides such as salsa and guacamole, until I realize that I’m essentially eating a dinner made of a collection of side dishes — this happens to me all the time and I love it. 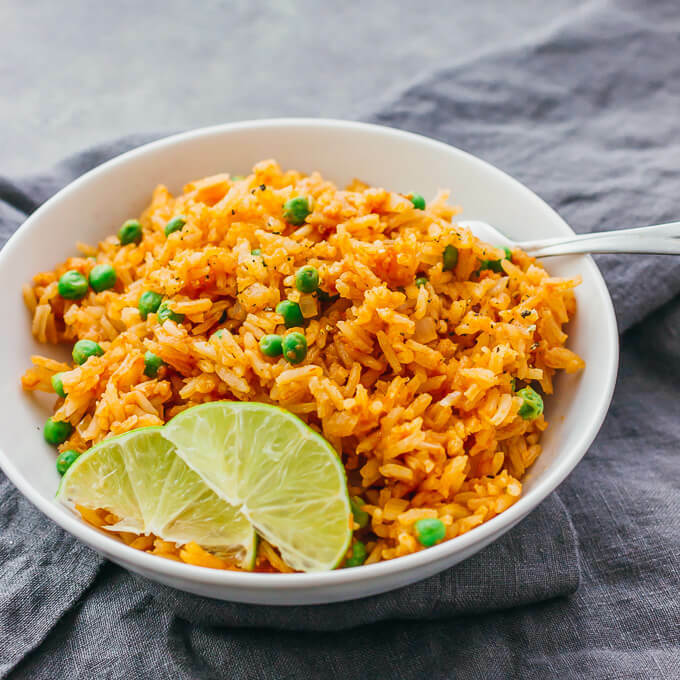 This Mexican rice is also flavorful enough that you can eat it by itself, which Mr. Savory Tooth and I occasionally do, curling up on the sofa with heaping bowls of delicious Mexican rice. If you’re vegetarian, just substitute chicken broth with vegetable broth. I prefer chicken broth because of its flavor, but using vegetable broth won’t make a big difference in how the rice turns out. I consider this Mexican rice to be mildly spicy. It has a hint of spiciness but definitely doesn’t overpower the dish. If you want spicier rice, you should include the seeds from the serrano pepper, or you can use more than one serrano. You can substitute with other peppers such as jalapeños. Any kind of long-grain white rice will work well here. I usually use jasmine rice or basmati rice. Make sure that you simmer the rice on low heat. If you simmer on medium-low heat, that is too hot and your bottom layer of rice will be overcooked and possibly burnt. Low heat is essential for cooking the rice evenly. It’s important to follow the recipe’s proportion of liquid and rice. If you add too much liquid, your rice will turn out mushy and will fall apart easily. The serving size of the recipe assumes you’ll be eating this rice as a side dish. If you plan to eat dinner portions, you will need to double or triple the servings accordingly. 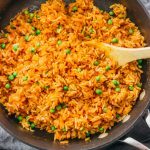 This mildly spicy Mexican rice is easily cooked using a single pan on the stove, and has lime, onion, and garlic flavors. Heat oil on a high-sided pan over medium-low heat for a few minutes until hot. Add rice and cook until lightly golden, 10 to 15 minutes, stirring frequently. Add onions, garlic, and serrano pepper, cooking and stirring until fragrant, a few minutes. Add chicken broth and tomato puree, stirring together with the rice. Bring to a boil over medium-high heat. Cover with a lid and reduce heat to low. Simmer until the rice is tender and the liquid has been absorbed by the rice, about 20 minutes. Uncover the pan and stir in peas. Add salt and pepper to taste. Squeeze lime juice on top. Oh boy! 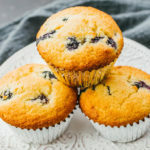 That looks like a winning dinner recipe! 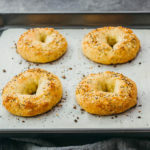 This was really easy to make! I’ll be using this for my Mexican dishes from now on. Thanks for sharing!